Scanning speed: 50 pages per min. Say goodbye to the days of slow flatbed scanning! 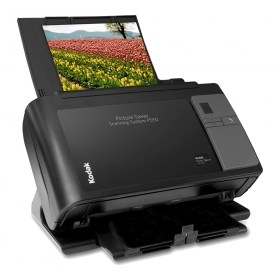 Scanning pictures and other memorabilia is now fast and easy – with great profit potential – thanks to the KODAK Picture Saver Scanning Systems PS50 and PS80. Just think – while it used to take one to two minutes to scan a single photo on a flatbed, you can now scan up to 85 photos in just one minute! And the image quality and automatic enhancements are simply dazzling, thanks to easy-to-use, intuitive KODAK Picture Saver Scanning Software.